Coalition forces led by Saudi Arabia have carried out a series of devastating bombing raids on Yemeni schools, a human rights organisation has claimed. Amnesty International claim five air strikes, conducted between August and October 2015, deliberately and repeatedly targeted schools, killing five civilians and wounding at least 14 – among them four children, and disrupting the education of an estimate 6,500 children. The international human rights organisation says such strikes are a clear violation of international law and a war crime and that the US and UK should suspend the sale of weaponry used in the attacks to the Kingdom. Right now we are living in fear and in terror. “Deliberately attacking schools that are not military objectives and directly attacking civilians not participating in hostilities are war crimes,” Lama Fakih, Senior Crisis Advisor at Amnesty International, said. 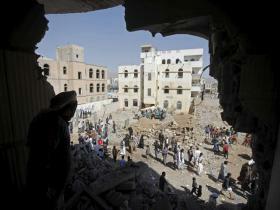 The Kingdom has repeatedly denied it targeted civilian buildings. Ms Fakih, who recently returned from Yemen, went on to describe the important schools were to Yemen’s children and had offered a sole “safe space”. No pupils were in the schools at the time of the strikes – hardly surprising when 34 per cent of Yemeni child have not set foot in a classroom since March, according to Amnesty estimates. One school, attempting to educate approximately 1,200 pupils, endured four strikes in weeks. Speaking to Amnesty a 12-year-old female student said they were living in “fear and terror”. It is yet another blow to civilian life as the world’s “forgotten war” rages on. The Saudi-backed government intervention in March has failed to push back Houthi rebels, who continue to occupy the capital of Sanaa, while the government in exile operates from Aden amid pressure from the rebels and other extremist groups seeking the fill the vacuum. A UK government spokesperson told the BBC they took allegation of strikes on schools “very seriously” and had flagged their concerns to the Saudis. The spokesperson claimed kingdom officials reassured them they were complying. A recent UN report described the humanitarian situation in Yemen as “critical”. According to the organisation’s World Food Programme more than 60 per cent of the population is close to starvation.